Arriving; there were the teenagers, resolving negotiations with CanSupport volunteers, picking up medication, sitting on the mats, or just waiting to start the activities reserved for that day … They had already advanced that they would have a clown performance, and they were waiting for the chance. This performance was special, for the abundant laughs, for the improvised games that flowed like rivers, everything was expensive !!! There were also people in the audience were quiet, they were having a good time … although in a bad, very bad time … We try to convey all our love with the look, with our gestures, making them participants in this story, all together. In some cases they were amusingly stupefied, open-mouthed, they did not respond to the stimuli we proposed, especially the adults who accompanied the teenagers … At the end of the show we discovered that if they did not respond it was because they were blocked by shyness or by the surprise of the moment … a love of people! At the end Pukhraj invited us to eat, commenting on the importance of the emotional work of adolescents. Then we agreed to return the following week to do a clown workshop with the same teenagers … And it would be a pleasure !!! But what are you guys … it’s a pleasure to see each other again. The days passed, and the next Wednesday arrived !!!! the day of the workshop for teenagers. We are headed to CanSupport !!!! We reached the first floor, this time the adults were in the first part of the main room and the teenagers in the second part, separated by a screen … There we started the workshop. There were about 20 people, boys and girls. We start with the usual warm-up. We were aware that we had to lower the revolutions a bit, but it is also true that a little healthy march was going to make them enjoy themselves. It was a joy of motivation, participation and interest. They were delivered in each exercise. In the small improvisations, there were a couple of teenagers who saw innate qualities as clowns! They did not pretend, they did not force, they simply came from the heart. Their actions were rich in detail, easy to follow, with a tempo of silent film … It was a joy of workshop, these kids are very motivated … Maybe we can do something a little longer … we’ll plan it !!! We will love it !!!!! For them it was a great morning, with many surprises, emotions and above all love, that support we all need to know that things can go well, provide a smile, discover something, share a new moment, an emotion. So we end the day, with happy and happy people, between smiles and hugs … it is difficult to describe, we take it inside. 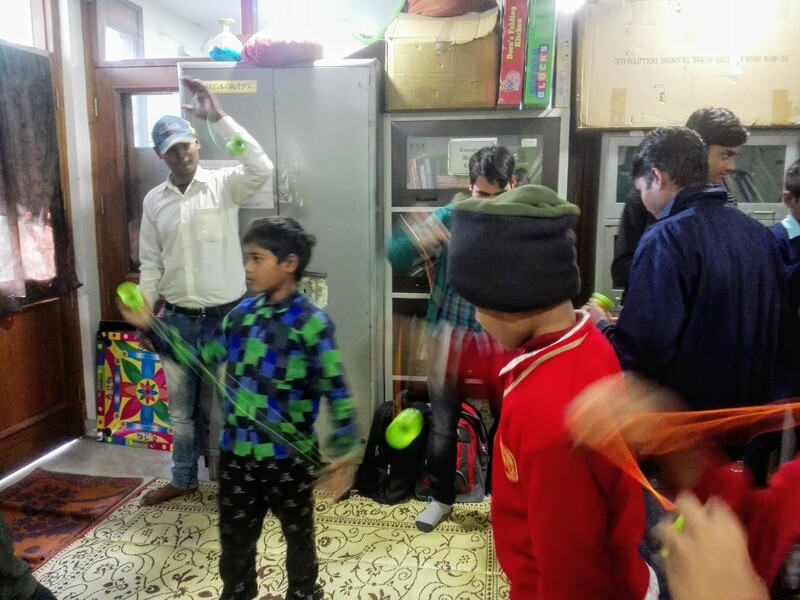 The next collaboration scheduled in Delhi has been with CanSupport, an organization that provides assistance to cancer patients without resources. They provide them with food, medicine and some extras that can change their lives. They also prepare a weekly Day Care for each group, children, adolescents and adults. There they perform meditation, do activities with volunteers, give them medicines and medical advice, and also provide some edible goods. We knew that we would act in Day Care, for children on Monday, teens on Wednesday and adults on Friday. The problem was that we did not know what a Day Care consisted of. We thought it would be on the floor of a hospital, and that we should be a hospital clown. So we contacted our friend Elena Donzel, who is a great artist and who, among many other skills, has great experience as a hospital clown, in Payasospital de Valencia. She gave us all the advice she could to plan the actions, with due respect and delicacy … and really that being a hospital clown is nothing easy … From here we want to convey our admiration to the professionals they carry out this work. And finally the day arrived, we found the place without too many problems, we went up the stairs until we reached the living room and there we got an idea of ​​what it would be like. It was a large room, covered with wicker rugs where mothers sat with sick children. There we would do our thing for 1 hour and a half. We expected to have to interact in different spaces, but that was not the case, they were all in the same space, so we could do our number Sighing Brushes … And so we did. A feeling that we still remember, comforts us at the same time that weighs us down. The most active children could not stay seated, they got up, they approached, we took them out of volunteers, all with a smile of excitement, of emotion. At the end of the number we continued with finger puppets that we had not yet used throughout the trip. We tried to create a story but it was not easy, they quickly pounced on our fingers, they did not want to be sitting looking … they wanted action !!!! 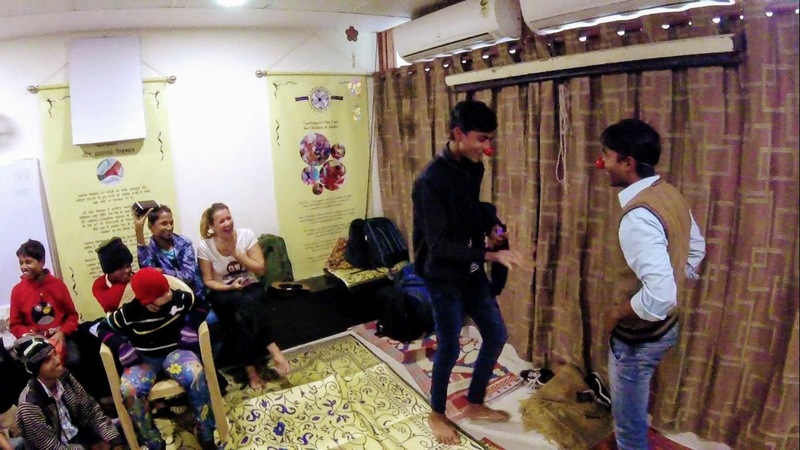 The following collaboration was obtained thanks to the contacts provided by Emily from Performers without Borders, an NGO that is responsible for touring theater workshops to people without recourse. A fantastic work. So they passed us the contact of Raj, the director of the foundation Duniya Educations, founded by a Dutch couple. With Raj we agreed to do two workshops and acting. So we went there! The school is very nice. It has three classrooms for students, and a room with sewing machines to teach women how to make clothes that they can sell later, and also a beauty salon school. A whole project to empower this community. We started the warm up, all imitating each movement and word, super attentive to the instructions. As we progressed, they became more and more involved and engaged. At the time of the improvisations they all got up as volunteers, very motivated. They were very cute with their noses, with all their innocence, without even trying, they were the most sincere clowns we have ever seen, a gift for the heart. The next workshop was for children a little larger, with a gesture of responsibility, and showing their complete willingness to the workshop. Everything was like silk, they were attentive and playful, they made jokes, they went out of their way to be volunteers, a group of the most motivated, although the occasional student showed shades of shyness. While we were changing the children went home, we said goodbye to Raj and the school and walked back to the guest house Brown Bread Bakery. In the afternoon we finished the workshops at the Mount Kailash school and from there we walked 1 kilometer to reach the Pemachal Shakya Tibetan Buddhist monastery. It is a monastery school that welcomes some 200 novice monks to instruct them to Buddhism. The building was quite spectacular, large and colorful. Our contact was Mr. Karan, a teacher at the monastery school who is not a monk. We had stayed with him to act at 3:00 pm, but we had a little delay. When arriving Karan invited us to have a tea and a pasta, seeing the comings and goings of the monks of the monastery. The place was particular, emitted a different energy, all dressed in burgundy, with shaved heads, monks and novices are of Tibetan origin, with the characteristic features of its people, a place that impressed us, reminding us that we were very far from home. After tea we went to prepare the space for the performance. On the way some young monk asked us what we were going to do, and after explaining it his face was of surprise and doubt. There were very young monks, and in some we could see an unusual maturity. We did the performance outside, at the end of some stairs that made us of stands, that way we gained light and the brightness of the space. We were nervous, we did not know what we would find, if they would like what we offered … we were in a Buddhist monastery … we had to forget any fear and give everything in the number, so there would be no reason not to be satisfied. When the time came, the music started to play. We appeared on the scene, there were about 100 monks, sitting on the steps of the stands. Everyone looked puzzled, impassive. It was not easy to build a relaxed atmosphere, we were nervous, but little by little we all got into the story, and the audience with us. The energy had dropped to freezing levels, the monks’ face denoted that the situation had not been comfortable … we had to go back, to give everything! Aaaaaarg !!! Little by little we regain the reins of the moment and move the whole audience back to our world, thanks to their generosity and our energy. The complicity returned with all of us. When we took out volunteers they left laughing to see their classmates suffering on stage … The final part was smooth and emotional, and we were all living it, accompanied with laughter and games, together. Finally it was a public taste, as cultivated people were seen a higher critical level, although they had never seen anything like what we had offered … We asked them to take a picture with all together and the result was exceptional. An image that takes us to other worlds, to other times, to other dimensions of thought. An incredible experience, thank you for letting us share it with you. When we finished changing some monks came to talk with us, interested in our project and praising the piece they had seen. It is a pleasure to talk with people so hungry for knowledge, with curiosity, as if each new information were being completed. And we went where we had come, satisfied, it had been an unrepeatable experience that will remain inside us … See you soon! And finally we are in India !!!! Oooooeeeeh !! We leave Nepal, and after 24 hours of travel on several local buses, some about to dismount and sometimes lacking glass in the windows, we arrive in Varanasi. Varanasi is one of the most emblematic and sacred cities of India. That’s where every Hindu who can afford it takes his beloved ones to be cremated on the banks of the river Ganges in a sinking ceremony … a show of religion, mysticism and sadhus (people who abandon all earthly life to meditate and do yoga). In this city we contacted Learn for life, an NGO founded and directed by Nicole and Michael, a very nice couple. They have several projects underway. 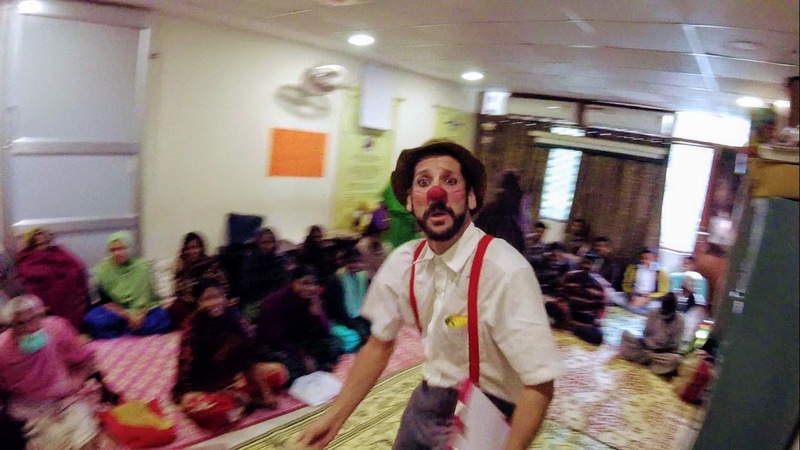 We collaborate with them doing two clown workshops and one performance at the school they manage. In addition, they have a bakery that produce organic products made by local people. They are also training women in tailoring techniques and they make clothes that they then sell in the store they opened while we were there. We went to the guesthouse they have, Bread Brown Bakery. It was not easy to find it since since it was opened at least three imitations with the same or very similar name have appeared. Even one of them claims that he also sponsors a school that they do not even have open … The management of these people is very good, so we were not surprised that imitators and envious detractors come out … Once there we talked with them and we agreed to do the workshops the next day, great! The school is a two-story building that houses the school, the bakery and the apartment of Nicole and Michael. It is an old building but it is correct and well taken care of. The youngest are in another farm across the street, with a large garden and a covered area where the youngest nursery play and learn with the teacher. In addition there is also the dressing room with sewing machines. The workshops were in this garden. The first group was about 25 children between 8 and 10 years old. We started as always warming up, giving game, and they responded accordingly, like children. We had a great time, playing, dancing, performing. The next workshop was 23 people between 10 and 12 years old. These were more naughty and rebellious, Nicole had already warned us. At first they revealed themselves by making jokes out of context, but by simply accepting them or even encouraging them to continue, they stopped making them out of context to put them in context and share them. The whole workshop was great, some were more shy than others, but we encouraged them and everyone participated. It was time to eat, all the children had a tray full of rice, like ours, rice biryani, very rich. Then, he played the show, so we set the stage in the same courtyard where we did the workshops. We commission one of the volunteers, Sophie, to help us with the sound, the usual routine. And we changed and put on makeup in the sewing room. Everything was ready, we gave the signal to start and the music began to sound … what nerves !!!! We went out and everything began to work, the laughter began to sprout, the children accumulated in the first row overflowing. Everything was going smooth, everybody was so into the history, when suddenly deafening drums began to sound, were the political parties that made comparsas around the city as if it were a religious demonstration, with passionate shouts, hymns repeated by dozens of people … In short, a good roll cut that lasted 5 minutes until they disappeared down the street … We gave him all the game we could while it lasted, but to be honest, he cut the roll a lot. We needed to get them back !!! And so we did, with all our energy we shared the story again, together we went back and the laughter and love between the lady and the painter returned again … In the end, applause and clashes of palms, hugs and thanks . It was a great day, with fantastic people, and an NGO project full of good vibes. 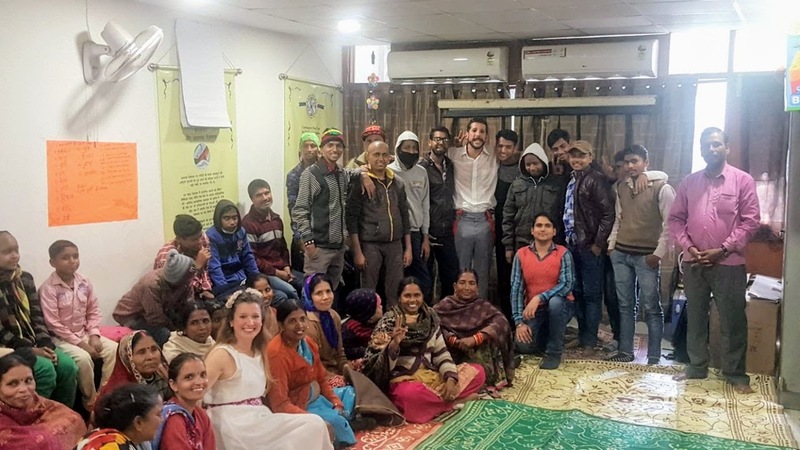 Upon returning to the main building Nicole and Michael offered to be free at their guest house, Brown Bread Bakery, possibly the cleanest and most pleasant of all Varanasi, and 50% discount on food !!! 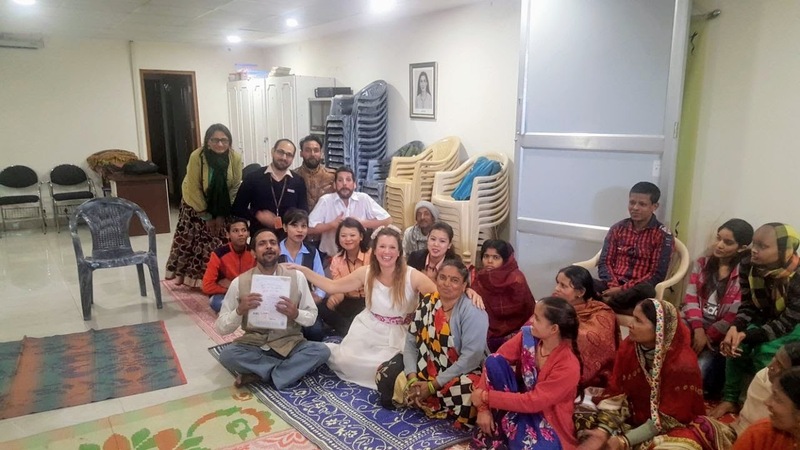 A great offer that we did not reject … They let us stay all the time we were in Varanasi, 4 more nights, even while collaborating with other NGOs, an unexpected gift. In summary, many thanks Learn for life for the collaboration and the facilities that you have given us, you are fantastic people doing a great job!